Hey again! I’m not doing a full review here, but since Superior Iron Man #3, in which Matt once again makes a very substantial appearance, also came out last week, I wanted to mention it here. Overall, I was very impressed by this issue, by writer Tom Taylor and artist Yıldıray Çınar. Handling a story in which Matt regains his sight (as you know, there have been quite a few of those) can be tricky, but I actually think it’s handled very well here. I also enjoyed the overall story. 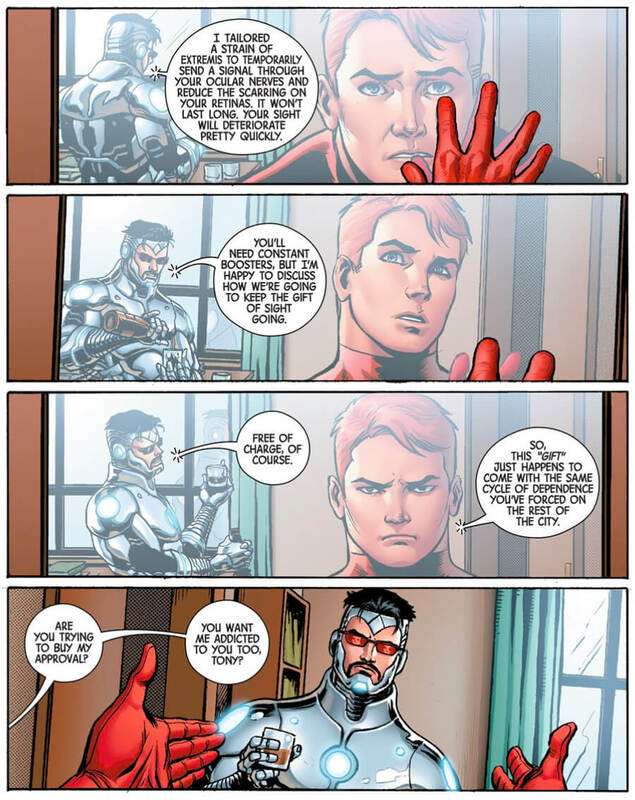 Tony Stark is evil, yet somehow believably so – more on that below – and there is also a humorous undertone in the use of new villain “Teen Abomination” who, it turns out, is equal parts abomination and teenager, with all the requisite insecurities. So, what’s the deal with Matt and Tony? 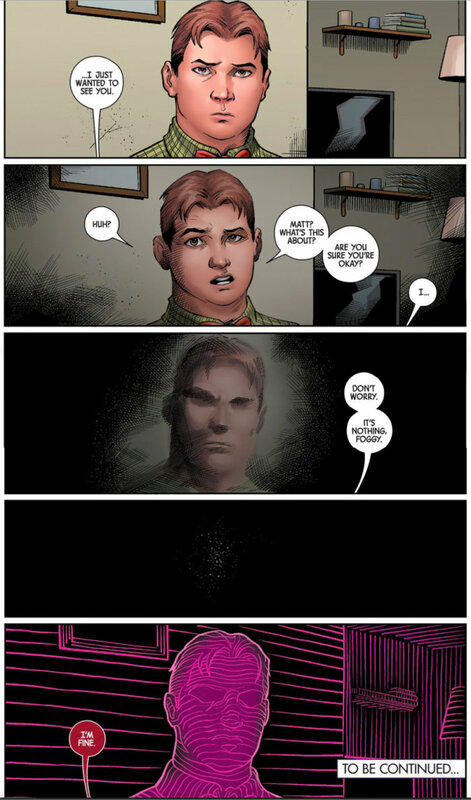 Well, the last thing to happen in Superior Iron Man #2 was that Matt awoke in his apartment, realizing that he could see again, and that is where this issue picks up. Matt is appropriately bewildered. He touches his reflection in awe, but the outrage at what Tony has done, without Matt’s consent, is infuriating. Tony’s arrogance is striking. 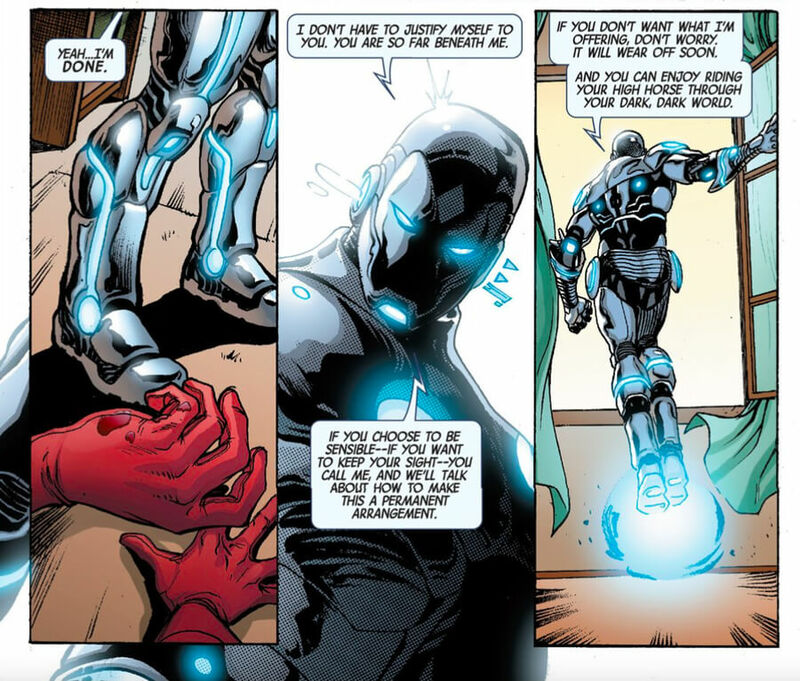 The Superior Iron Man story obviously has its origins in the Axis event, the consequences of which has meant that some good guys go bad, and vice versa. This is what has left Tony’s mind altered. I personally consider the notion of good and evil as a simple “switch” to be a little too simplistic to be interesting, but these creators do interesting things with it by simply tapping in to Tony’s lowest impulses. It seems pretty obvious that Tony has a god complex, so in order to unleash “evil Tony” all Taylor and Çınar have to do is take the next logical step. Pitching this version of Tony Stark against Matt Murdock, with all his dearly held principles and physical imperfection, makes for pretty interesting reading. After Matt is knocked to the floor, Iron Man darts off to deal with Teen Abomination, and Matt – interestingly – goes to see Foggy. Emphasis on “see.” Since this story is set after Matt and Foggy’s arrival in San Francisco, it would be more appropriate for Foggy to appear ill, but I will certainly forgive this minor oversight. As I’ve mentioned before, a “Daredevil gets his sight back” storyline is not an easy thing to pull off. You have to make sure the status quo is restored in a way that’s plausible, and you have to address the fact that Matt’s feelings about regaining a sense would most likely be quite complicated. This issue handles both of these things really well. By making the change temporary – in the very same way as everybody else’s Extremis app enhancements – you take choice out of the equation. At the same time, it makes sense for Matt to be furious at Tony for taking such liberties without his permission. I don’t believe that there is a shred of gratitude on Matt’s part, because of how the “gift” was given, but at the same time, he is not going to let the opportunity to use his sight go to waste. He goes to see Foggy because getting to see him is valuable and meaningful to him. And that really tells us everything we have to know. Have you been reading Superior Iron Man? What did you think of this issue? Pft who cares about cups anyway. You bring up a lot of good points about the whole good and evil thing. And I really love Tony talking about how he’s been playing a human. Fascinating stuff. Hmmm… I don’t think Taylor is going there. I DO believe that showing Foggy apparently healthy is an oversight. However, we do know that Extremis makes the user perfectly good-looking, able-bodied… and healthy. What if Foggy’s appearance isn’t an oversight and he is using Extremis as a cancer treatment? I really doubt I’m on the right track with this. But I still can’t help but speculate. I have to say that I like the fact that the Rivera/Samnee radar has become the standard way in which the radar is portrayed! This looks like interesting stuff, especially with the analysis of Tony’s mental state. Very interesting and telling. I read the last volume of Ironman and I liked it pretty well but dropped it with the launch of this volume, I might have to pick it back up.